SEATTLE, Washington — In August 2017, the world watched in horror as the Myanmar military unleashed a brutal campaign in the country’s Rakhine state. Targeting the Rohingya people, a Muslim ethnic minority, the attacks killed an unknown number of men, women and children. Reports of widespread sexual violence, torture and scorched earth tactics drew international condemnation in what the U.N. High Commissioner for Human Rights (UNHCR) called a “’textbook example’ of ethnic cleansing.” The majority of Rohingya refugees are currently living in Cox’s Bazar, a refugee camp in Bangladesh. Although these refugees are now safe from the violence in Myanmar, life in Cox’s Bazar is far from easy. The attacks triggered a mass exodus, unparalleled since the 1994 crisis in Rwanda. In 2017 alone, almost 700,000 people fled to neighboring Bangladesh. Thousands of Rohingya families sought shelter in dangerously overcrowded refugee camps while local governments worked desperately with the U.N. and other humanitarian aid organizations to find a solution. Now, nearly a year and a half later, the world has yet to find an answer. Bangladesh, a small coastal city only 25 miles from the Myanmar border. Roughly one million people reside in bamboo and tarp shelters in the Kutupalong and Nayapara encampments, the worlds largest refugee camp. These camps have housed Rohingya refugees since the early 90s, providing relief for one of the worlds most persecuted minorities. However, the recent attacks have severely strained the camp’s resources and staff. Almost all of the health complications in Cox’s Bazar camps stem from living conditions. In 2018 alone, Doctors Without Borders (Médecins Sans Frontières-MSF), conducted more than 90,000 medical consultations for acute watery diarrhea. According to MSF, the main health issues, which include diarrheal diseases, upper and lower respiratory tract infections and skin diseases, are directly related to problems with sanitation and access to safe drinking water. Simple things like washing hands, cleaning cookware and other hygiene-related tasks become exponentially harder in a muddy tent without running water. Though still underfunded and understaffed, nongovernmental organizations like MSF, IRC, World Health Organization (WHO) and UNHCR quickly established themselves in Cox’s Bazar during the 2017 crisis. 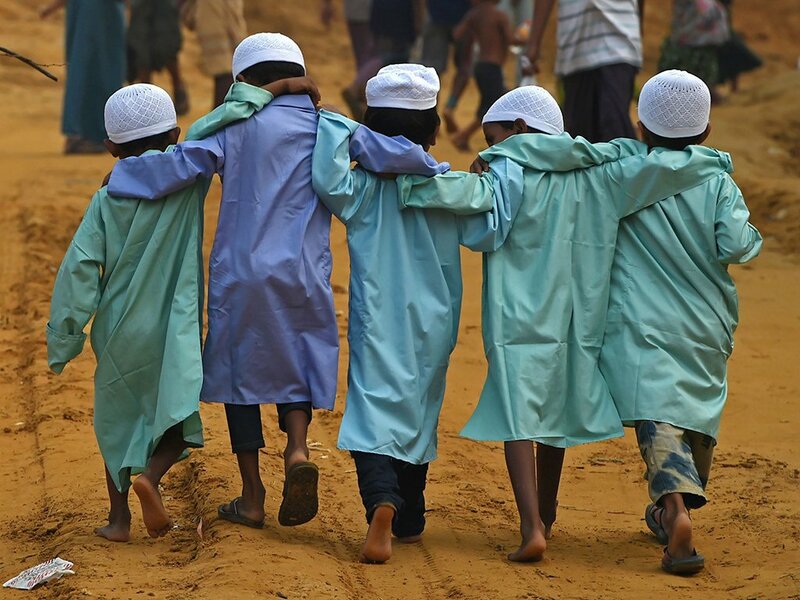 Since then, these organizations have provided healthcare, supplied medicine and supplies, improved hygiene and offered mental health counseling to hundreds of thousands of Rohingya, alleviating the pressure on Bangladeshi authorities while the international community searches for a more sustainable solution. Being the world’s largest refugee camp, humanitarian aid groups have an endless stream of issues to address in Cox’s Bazar. Conducting over one million medical consultations since August 2017, MSF has played a key role in the Rohingya community. The organization distributed 23 million gallons of clean water to address the rampant diarrheal diseases, treated roughly 10,000 people for diphtheria and measles and continues to dispatch emergency response teams to restrain disease outbreaks. MSF has also prioritized mental health services as many Rohingya still cope with severe trauma after witnessing atrocities in Rakhine. Once a foreign concept for Rohingya communities, MSF provides individual and group therapy sessions, psychosocial stimulation for malnourished children and treatment for psychiatric conditions. Yet, only 5 percent of MSF’s consultations have addressed PTSD as cultural barriers and stigmas often dissuade individuals from seeking help. Seeking to dismantle these roadblocks, MSF reports low drop out rates and a high number of successful discharges for mental health programs. What’s Next for the Rohingya? For the nearly one million Rohingya living in the refugee camp, the future is unclear. Both the IRC and MSF report that most refugees wish to return home once the situation is stable; however, the Rakhine state is far from safe. According to Amnesty International, Rohingya militias recently ramped up attacks on police outposts, drawing a violent response from Myanmar security forces that displaced roughly 5,000 people this past January. Arbitrary detentions, unexplained disappearances and restrictions on food and foreign aid continue to afflict Rohingya communities across Rakhine state. Myanmar has become an increasingly dangerous place for journalists and aid workers. While some Rohingya have returned home, all 42 nongovernmental organizations monitoring the situation in Myanmar warn that repatriation efforts are premature. In February 2019, Rohingya refugees were still continuing to flood into Cox’s Bazar, leading government authorities to construct new camps on the island of Bhashanchar where they may be able to send 25,000 people. Yet, these responses are nothing more than a short-term solution to a long-term problem. As the world continues to search for an answer, one million Rohingya refugees are forced to face life in Cox’s Bazar with terrifying uncertainty. With continued violence and discrimination against the Rohingya in Myanmar, there is little hope that the refugees will be able to go home anytime soon. Continuing to provide resources to Cox’s Bazar and looking into alternative relocation sites may be the only way to alleviate the situation.